"Looking for something new to serve up during the holidays? Look no further! Holiday Entertaining Essentials: Christmas Cookies is a scrumptious selection of tasty treats that'll make your celebrations even merrier. From Molasses Stained Glass Cookies to Cranberry-Pistachio Biscotti, these festive cookies are perfect for parties, to give as gifts, or to leave out for Santa. Merry Christmas and enjoy! 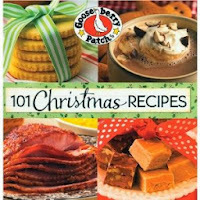 101 Christmas Recipes is just that...over 100 tried & true recipes with full-color photos for the most festive of all seasons. You'll be thrilled with so many mouthwatering recipes like Gran's rosemary roast chicken, cheddar potato gratin and cherry-pecan bread pudding...they'll delight guests too! What a great way to start the holiday season. 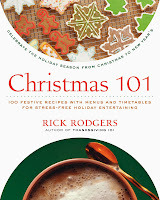 "Everyone knows that the holidays are hectic—but Rick Rodgers, cooking teacher and bestselling cookbook author, knows that they don't have to be. Christmas 101 offers the busy cook carefree ways to entertain with surefire recipes of old favorites, menus, timetables, make-ahead tips, and more. Rodgers will help you throw fabulous cocktail parties and traditional buffets, cook a perfect roast, and spice up your favorite recipes with a contemporary twist. You'll also learn how to make classic breads, candies, and desserts that are the tokens of this special time of year. 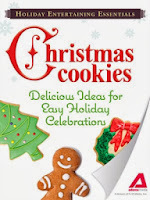 With patience, kindness, and humor, Rodgers will help you to cook up the very best holiday season yet."